- SmackDown Tag Team Champions Cesaro & Sheamus defeated The Usos and The New Day in a triple threat match to retain their titles. Cesaro & Sheamus won after Mandy Rose came out and distracted Jimmy Uso as he was about to hit a splash off the top rope. I thought this was a boring match, but the crowd was into it. There was some really bad timing between Lana and Deville that the crowd noticed. Fine match, though it wasn't anything crazy. Zelina Vega wasn't with Andrade. The crowd loved R-Truth and Carmella, but Andrade unfortunately didn't get much of a reaction. Fantastic match. There was major heat on Bryan. 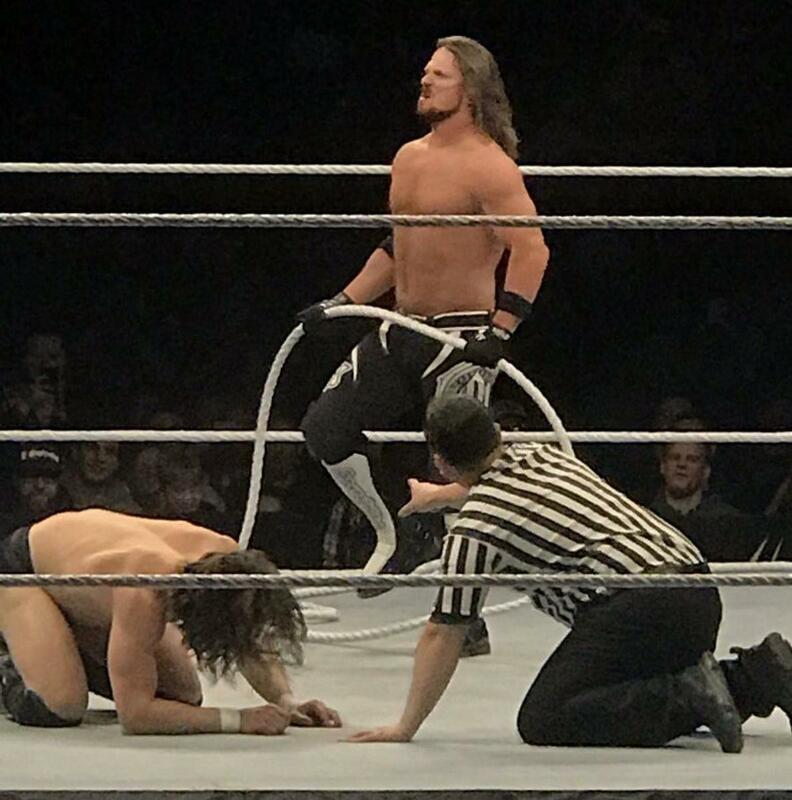 The middle rope broke about five minutes in when Styles hit it, and they stalled for a while. Styles got on the mic and said "It must be those Omaha Steaks I ate earlier today -- something you wouldn't know about, Daniel" to a big pop. They ended up just continuing the match without the middle rope. They beat the hell out of each other with the rope, and Bryan put the LeBell Lock on using it. Bryan ended up winning, and he called Styles a coward. Styles came back and gave Bryan the Phenomenal Forearm and Styles Clash. I loved all of this. The crowd popped for Benjamin, who got the win for his team. Young and Dain beat up English after for costing them the match. Fun little match. I heard a lot of cheers for Nakamura, which I thought was surprising. Lynch did not get as big of a pop as I expected, which was disappointing. Asuka was way over. This was a really good match. Charlotte and Lynch did a funny spot where they took turns rolling each other up for two counts for like a minute, then they both got up and stumbled around like they were dizzy, followed by Charlotte doing the Flair Flop to a big pop. Charlotte got a kendo stick out and hit both Lynch and Asuka with it a few times. Asuka won after making Charlotte tap to the Asuka Lock.